Preheat oven to 190oC, Fan 170oC, Gas Mark 5. Remove giblets and any spare fat from inside the bird. Use the spare fat to spread over the legs of the goose. Stuff the neck with your chosen stuffing. Prick the skin and rub salt and pepper over it, then brush with cooking oil or butter. Place the goose on a rack or crumpled foil in the meat tin, breast side up. Do not cover. Cook in the centre of a preheated oven for 30 minutes per kilo plus 30 minutes. That's around 2 hours 45 minutes for a 4.5kg goose or 3 hours 15 minutes for a 5.4kg goose. Allow 20 minutes extra per 500g of stuffing. After the first hour, thoroughly baste the goose with its fat. When the cooking time's up, lift the goose on to a carving dish, cover with foil and rest for 20 minutes before carving. This retains more of the juices for a more succulent meat. Save the fat for roast potatoes or for basting other meats. Goose fat can be stored in the freezer and used to make top quality pastry. 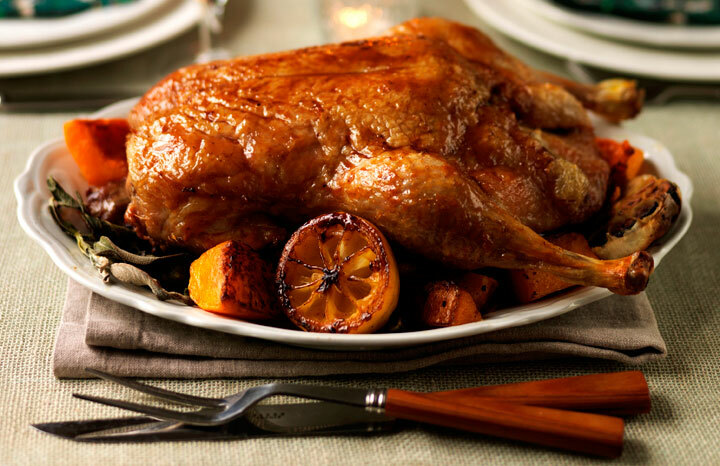 Enjoy a traditional roast goose which tastes great any time of the year!